This is for a Shabby Distressed Ivory Metal Double Chandelier. 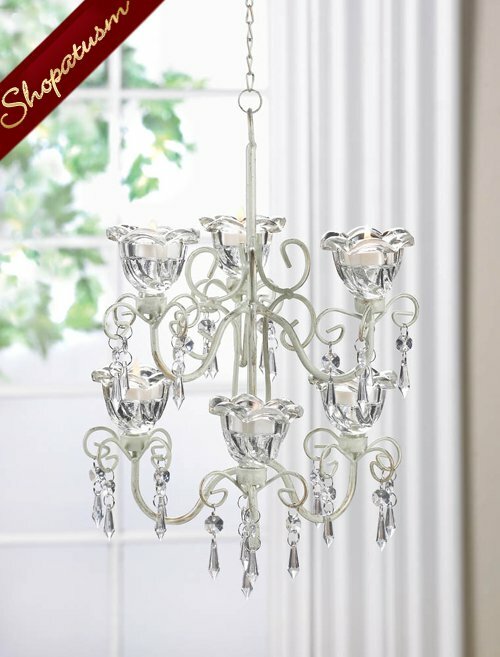 Gorgeous crystal flowers bloom to create a romantic lighting feature for your favorite room. The ivory distressed metal scrollwork holds six clear candle cups as dramatic faceted jewels hang down to capture the candlelight. Item weight: 2.8 lbs. 10 inch x 11 1/4 inch x 12 7/8 inch high; 12 1/2 inch long hook and chain. Metal and glass. Candles not included.